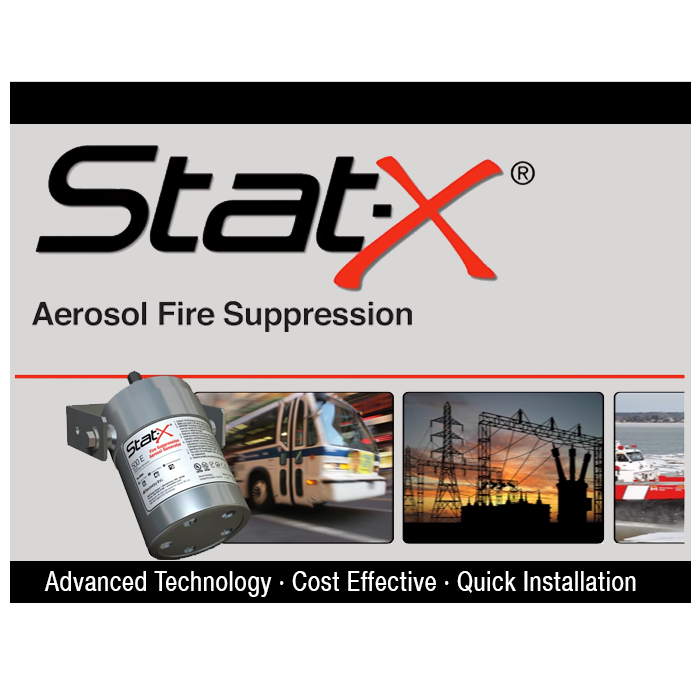 Stat-X® fire Suppression Systems is a potassium aerosol technology providing safe and superior fire suppression with remarkable reductions in weight, space, and maintenance. 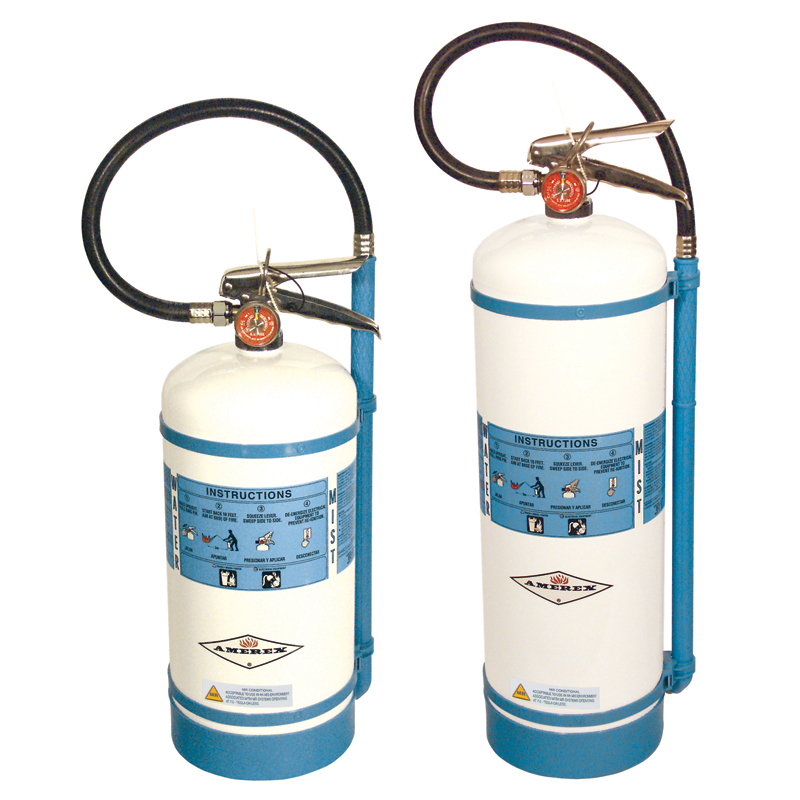 Applications include enclosed special hazards such as: vehicle engine compartments, machinery spaces, and industrial areas. 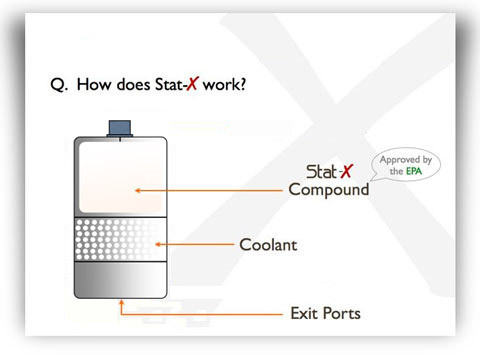 Stat-X is made in the USA and approved of normally-occupied space! 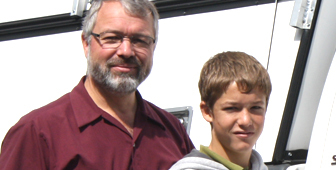 The Stat-X First Responder® is hand deployed for emergency first responders. Environmentally friendly, no ozone depletion, or global warming potential. 1. The Stat-X generators are self-contained, eliminating the need for expensive pressure vessels, piping, and installation manpower. 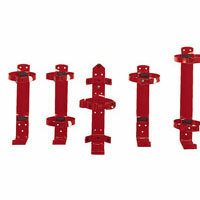 This significantly reduces both initial installation and ongoing maintenance costs. 2. 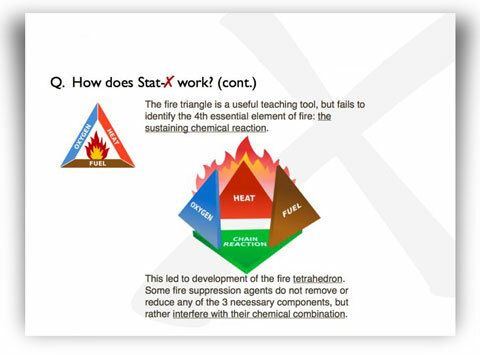 The fire triangle is a useful teaching tool, but fails to identify the 4th essential element of fire — the sustaining chemical reaction. This led to development of the fire tetrahedron. 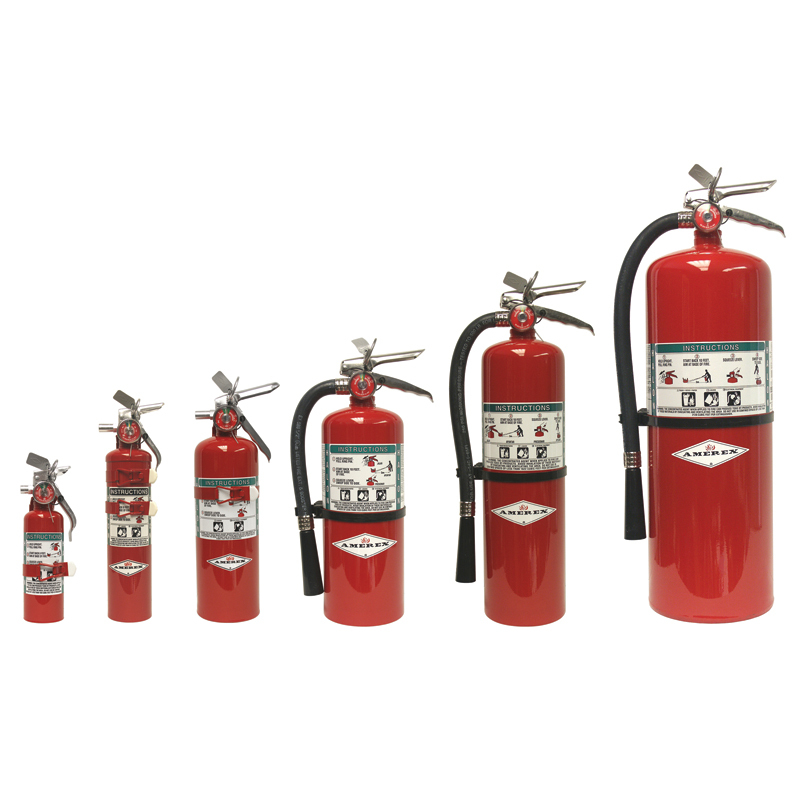 Some fire suppression agents do not remove or reduce any of the 3 necessary components, but rather interfere with their chemical combination. 3. 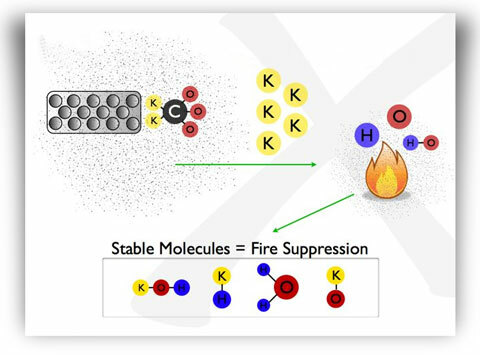 “Free Radicals”* are essential to the propagation of a fire — OH, H and O. Stat-X suppresses the fire primarily by chemical interference with these “free radicals” within the fire zone. 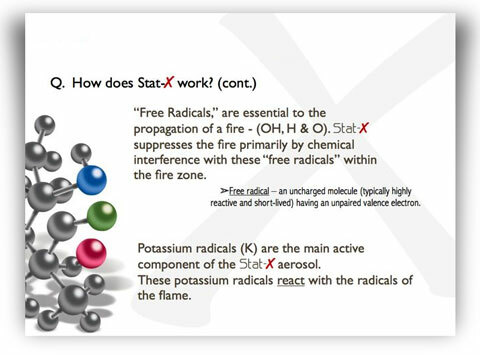 Potassium radicals (K) are the main active component of the Stat-X aerosol. These potassium radicals react with the radicals of the flame. * Free radical — an uncharged molecule (typically highly reactive and short-lived) having an unpaired valence electron. 4. 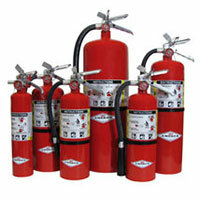 The ultra-fine aerosol flows like a gas, and extinguishes by chemical interference with the flame’s free radicals. Because of its ultra-fine partical size, the aerosol hangs in suspension for up to 60 minutes, and is easily vented by fan or air-handling system after discharge leaving virtually no residue behind.